Source: Kings Mountain U.S. Monument, Kings Mountain National Military Park, Blacksburg (SC). Constructed of white granite from the Mount Airy quarry in North Carolina, the U.S. Monument towers 83 feet high above Battleground Ridge and rests on a two-stepped marble base (16’ x 3” squared). The interior of the obelisk is hollow, and the white marble bricks are contrasted against dark mortar. The diagonals of the obelisk roughly correspond to the four cardinals of the compass. And on each side of the monument are bronze tablets that dedicate the monument to the patriot victory at Kings Mountain, discuss the significance of the battle, list the American and British commanders, and list the Americans killed in battle. South face: ON THIS FIELD THE PATRIOT FORCES / ATTACKED AND TOTALLY DEFEATED / AN EQUAL FORCE OF TORIES AND / BRITISH REGULAR TROOPS. / THE BRITISH COMMANDER MAJOR / PATRICK FERGUSON WAS KILLED / AND HIS ENTIRE FORCE CAP- / TURED AFTER SUFFERING HEAVY / LOSS. THIS BRILLANT VICTORY / MARKED THE TURNING POINT OF / THE AMERICAN REVOLUTION. US Congress. House. Kings Mountain Battlefield (H.rp.3162) by Charles Randolph Thomas, 59th Cong. 1st Sess. April 10, 1906, Serial 4907. US Congress. Senate. Kings Mountain Battlefield (S.rp.4241) by George Peabody Wetmore, 59th Cong. 1st Sess. June 8, 1906, Serial 4905. Colonel Ashbury Coward of Orangeburg, SC called the dedication ceremony for the US Monument in order at 10:30 AM on Thursday, October 7, 1909. Thousands congregated around the grandstand and monument with bands playing celebratory music. Several prominent individuals were in the audience, including Senator Lee S. Overman of North Carolina, Senator Smith from South Carolina, and General Julian S. Carr. The Kings Mountain chapter of the Daughters of the American Revolution held charge of the event, and the United Daughters of the Confederacy assisted in distributing pamphlets and cards. After initial remarks by Colonel Coward, President S.C. Mitchell of South Carolina University led the invocation. This was followed by a rendition of the “Kings Mountain Centennial Lyric,” written by Mrs. Clara Dargan Maclean, arranged to music by Professor Linebach, and performed by the Yorkville band under the direction of Professor R. J. Herndon. Governor Marin F. Ansel of South Carolina took the podium winning over the crowd with his “pleasing and happy manner.” Governors W. W. Kitchin of North Carolina, M. R. Patterson of Tennessee, and J. E. Brown of Georgia followed suit. Next came an oration by Dr. Henry N. Snyder, president of Wofford College and the the D.A.R.’s selection for an oration. And finally Congressman D. E. Finley of South Carolina and Honorable R. N. Page, who spoke on behalf of Congressman E. Y. Webb, offered their own words. After three and a half hours of speeches, the dedication ceremony concluded with a doxology and benediction. The following morning, Friday, October 8, 1909, at 9 a.m. the combined North and South Carolina National Guard recreated the battle under the command of General J. C. Boyd Adjutant General of South Carolina. The North Carolina troops were from Dallas under the command of Colonel J. T. Gardner of the First Battle Field Artillery National Guard of North Carolina, with additional assistance from Captain Robertson and Captain A. L. Ballwinkle. Colonel W. W. Lewis commanded the South Carolina provisional regiment which consisted of First and Second Infantry National Guard companies from Greenville, Cornwell, Rock Hill, Columbia, Camden, Fort Mill, and Spartanburg. McKim, Mead and White, a prominent New York architectural firm, were hired in 1906 to design the United States Monument at Kings Mountain. Better known for their beaux-arts inspired public buildings such as Penn Station, Mckim, Mead, and White also created public monuments. While the U.S. Monument is one of the firm’s less complex designs, it maintains their aesthetic perspective with a strong profile and form over ornamentation. Careful consideration was taken for materials selection, construction, and presentation, resulting in a fine example of early twentieth-century monumental architecture. In September 1907, it had been decided that the monument would take the shape of an obelisk. 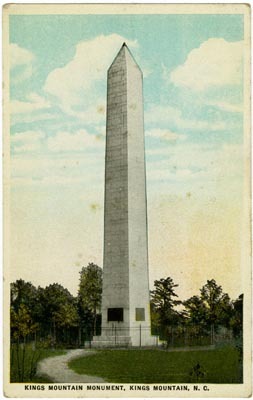 Two years earlier, McKim, Mead, and White had designed the Saint Mary's Falls Canal 50th Anniversary Memorial Obelisk in Sault Sainte Marie, Michigan, a smaller-scaled obelisk that likely served as the architectural inspiration for the U.S. Monument. The decision to erect an obelisk at Kings Mountain reflects the cultural fascination with Ancient Egypt during the nineteenth century. Since its origins in Ancient Egypt, the obelisk has been seen as a symbol of reverence, dominance, and patriarchy. The intended height of the monument changed from 115 feet to 83 feet due to problems with the foundation. In addition, the tablets were not ready in time for the installation of the monument on June 12, 1909, a fact noted by the press at the time. They were subsequently installed on January 19, 1910. The monument resides on Battleground Ridge in the northeastern part of the part at the park's highest point, and it stands in line with the Centennial Monument. The Kings Mountain National Military Park address is 2625 Park Rd, Blacksburg, SC 29702. The monument is located in a clearing at the top of the heavily forested ridge. The design of the monument was approved under the authority of the Secretary of War of the U.S. Government.